Rich here with a CBAP®/CCBA® registry update. IIBA has introduced a new online credential registry. It is real-time and shows the complete list of CBAP and CCBA credential holders. This is a nice change compared to the older spreadsheet method, which was outdated almost as soon as they published it. By default the list is alphabetical by last name. The registry also permits sorting by first name, city, State/Province, Country and certification date. Noticeably missing is the ability to search for a person, which one hopes IIBA would add. 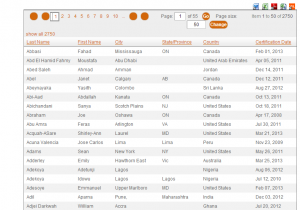 It is a bit difficult to locate a person by scrolling through the list or guessing which page number they are on. (I found myself after some poking around). You can click on the image below to access the registry web page. This list will be a boon to anyone who needs to verify if someone is a CBAP or CCBA. Sadly, the BA profession is starting to face the same issues that occurred with the PMP: namely, some people are listing themselves on resumes as certified when they are not. With the registry, it will be harder for people to claim they are certified when they are not. If you are already certified, go ahead and try out the new facility. Check to see if your friends or colleagues are certified too. And spread the word that this facility is available so we can curtail the phony claiming of credentials that are hard to achieve and represent a true commitment to the BA profession.